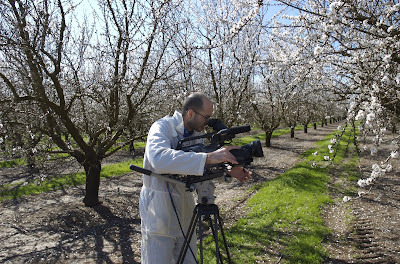 The almond trees unfold their blossoms right around Valentine's Day every year. By then, more than half the honeybees that exist in this country have been trucked in and are now poised between the orchard rows, ready to get to work. It's an exhausting affair; an unnaturally early spring for most of the bees, and a simple diet that lacks nutrition. And - as one beekeeper told Singeli - the diseases passed in this floral brothel make it a risky venture for the beekeepers. Here's Josh, trying to catch some action on film.